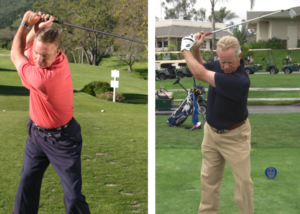 The golf swing DEMANDS superb upper body flexibility and functional leg strength. Without these two ingredients, it is almost certain that a fundamental golf swing will be unattainable! FACT: Pro Tour Players have nearly twice as much Upper Body Flexibility as the average golfer! FACT: Last year over 30 million Americans visited an Orthopedic Surgeon to be consulted for some form of joint surgery, and these same people are bringing their anatomical dysfunctions to the game and physically have a hard time of it! FACT: Roger Fredericks knows WHY. “LACK OF FLEXIBILITY IS THE AVERAGE GOLFER’S # 1 PROBLEM!” And, most people that do recognize this don’t know how to stretch correctly, or how their lack of range of motion directly affects their golf swing mechanics. Fill out the Form Above to Take the FREE Flexibility Test.